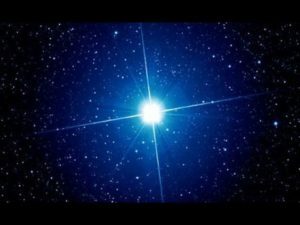 The Sirius blue star, the brightest star visible from Earth, is the physical aspect of the Sirius system contained within the Milky Way galaxy. As a ‘stand-alone’ star system and also the portal to the galactic center, I am told Sirius vibrates at 5th/6th dimensional frequency. I started working with the Sirian light beings in 2004, through a spirit guide commonly known to us as Goddess Isis, or Auset (her Egyptian name). Besides their prowess and mastery in healing arts, I have found the Sirians among the most remarkable spiritual teachers I have had the honour to channel and be trained under. For me, and many of our workshop participants, the Sirians’ teaching style easily comes across as the perfect exemplification of balance and harmony: complex and sophisticated cosmo-metric concepts are always explained through simple, inter-connected and clear illustrations applicable to modern day living. For example, attuning our chakra body to a new energy frequency is akin to downloading a new app on our mobile phones to expand our human experiences, made possible by the internet which mirrors the inter-connectivity of cosmic intelligence. The final session of the Self-Mastery of Human Emotions workshop series will be held in Hong Kong over the weekend of 8-9 December. 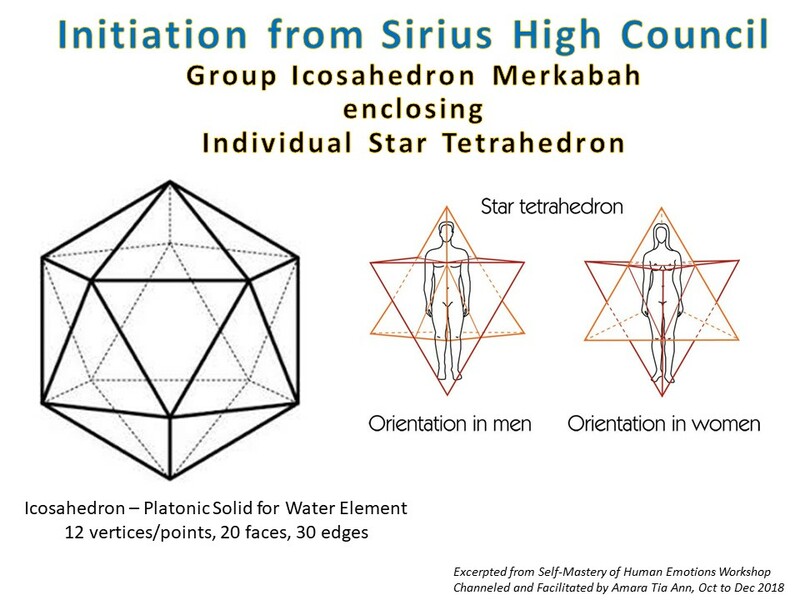 The program involves attuning the group to the Sirius High Council by aligning our chakra and light bodies vibrationally to the Sirius 6th dimensional energy frequency. This process can be explained, in esoteric terms, as initiating ourselves to a Sirian guide. 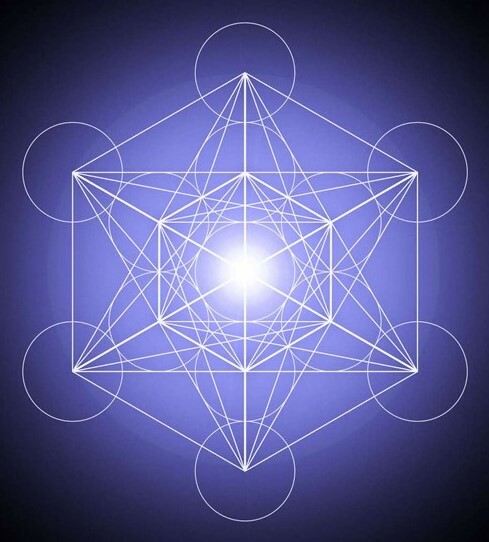 Command your mind to activate your personal Star Tetrahedron Merkabah, followed by visualising a 3-dimensional Icosahedron pattern descending from your crown chakra and encasing your body. Refer to diagram below. The above meditation can be performed at anytime on 8th December. Join us at Solstice Meditation! Solstice Meditation: “Meta-morphosis” led by Archangel Meta-tron will be held on 21st Dec 2018, Singapore. Admission by donation. Program available HERE. May you enjoy these New Moon gifts from Sirius! Receive Love like there is no yesterday. You will remain in the Now. your dominant emotions and thus, the higher purpose of your relationships. Elaboration: If we learn to strip off the memories (past judgement of non-love) and fantasies (future expectations of love forever) from our relationships and simply focus on the emotions presently experienced, we will come to understand and accept the recurring emotional pattern, reflected through our relationships, as our attempts to be our highest love expressions. From this new moon, may we honour all our key relationships as divine connections birthed from and for love. Go to Self-Mastery of Human Emotions for program and registration details for Singapore (10 & 11 Nov) and Hong Kong (8 & 9 Dec) sessions. It is perhaps common knowledge that words are powerful in shaping our thoughts and that they impact deeply the actions we take towards external conditions. The intermediary physiological process between a thought pattern and a habitual action is our emotions. While we can view both thoughts and emotions as the cause of our actions, the latter tend to be more visible and leave a deeper imprint in our memory for contemplation and self-examination purposes. If we can master the vibrational quality of our frequently-expressed emotions, we will be able to control the types of bodily responses (speech and behavioural tendencies) we express to the outside world, especially in our most intimate relationships. A consciously-chosen action, as opposed to a neutrally-triggered one, will only elicit and attract equally self-aware behaviours from others. This could be the most critical step towards building a 5th-dimensional world on planet Earth, that is, by first paying close attention to the quality of our personal relationships. Self-mastery of our emotions begins with self-awareness of what is and what is not. Here’s a suggested first step: the next time you notice a strong negative emotion brewing in you, be it anger, rage, resentful, jealousy, grief, regret or others, step away from the trigger-situation and recite the mantra ‘I AM not my emotions; I AM merely experiencing these emotions’. New perspectives, when sufficiently anchored in the mind through deliberate self-talk, will naturally lead to new and elevated expressions of your God Self. More principles, techniques and accompanying energy activations for enabling Self-Mastery of Human Emotions will be transmitted at new workshop led by the Sirius High Council. Go HERE for program, country-specific schedule and registration details. Light Bodies Reconfiguration 1-on-1 Sessions: Only 4 slots in October remaining. Read introductory article and session description and slots available. New Moon Blessings, Amara Tia Ann. The larger consciousness we are being influenced by, and which we are casting our influence upon with our thoughts and intentions, is constantly evolving and unfolding its plans. Whether you think of it at the cosmic, universal, galactic, solar or planetary level, such divine intelligence is forever expanding and decoding itself…with ease and harmony. An intimate and conscious connection with our soul serves to align us to the cosmic growth trajectory, so that our Earth lessons and experiences can unfold with the same ease and grace that prevails the cosmic sky. This process and goal of becoming an awakened soul-embodiment is the common purpose binding humanity. All the workshops and retreats I have been guided to facilitate were intended to support us in achieving this ultimate goal. If you have not been able to participate in these events to benefit from the teachings, practices and energy transmissions catalysing your soul remembrance, you may welcome the opportunity of working with Archangel Metatron through a new series of 1-1 sessions specifically designed for re-configuring your subtle bodies towards an accelerated soul expansion. Read HERE for session description and booking details. New workshop ‘Self-Mastery of Human Emotions‘ (Oct – Dec 2018) is open for registration. Program and registration info available HERE. Cecilia nicely summed up what my guides have long hinted as the beautiful outcome of the soul-personality integration that many of us will experience in this life. ‘lightness of being, resulting in effortless doing’ is one of the key topics for workshop series “Self-Mastery of Human Emotions’ sponsored by the Sirius High Council and Mother Gaia. Having a greater awareness of the true purpose of our emotional body and learning the art of engaging our emotions masterfully is integral to living the divine feminine principle and our soul essence of ‘lightness of being’. Workshops available in Manila, Singapore, Hong Kong from Oct to Dec (click HERE for details) and Dubai on 23 &24 Nov. Private consultations in September are fully booked by now. For wait-listed bookings and reservations, please email info@acast.me. Thank you! Reading and/or healing consultations with Amara Tia Ann are available over the next two weeks in September. All sessions will be conducted on Skype. Please go to Consultations for booking schedule and procedure. 5. Complete the meditation by grounding your awareness at the root chakra and exhaling deeply. Like our retreat participants, I am SO looking forward to be near the oceans of Byron Bay – most eastern part of Australia – at the coming New Moon Solar Eclipse. Besides being a powerful conduit to our emotions, the water element also catalyses our soul remembrance and connection with Sirius. I was told the first Sirian being on Earth was birthed through the seas of Gaia. Sirius is a 6th dimensional star system of the Milky Way galaxy. Her 3rd dimensional aspect appears as the brightest star in the Earth’s night sky in the constellation Canis Major, the Greater Dog. On an intuitive level, Sirius is regarded as “home”, and the Command Centre, to many Light Warriors who have journeyed to Earth to serve humanity during critical transitory times, such as Golden Atlantis and Ancient Egypt. I welcome you to connect with the spiritual hosts of our retreat – the Sirius High Council and Mother Gaia – if the idea resonates. 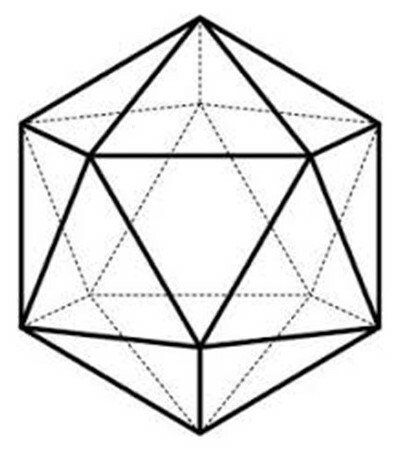 In the morning of 11 Aug or approx 10 Aug GMT 2300, visualise yourself in an icosahedron Merkabah (platonic solid representing consciousness of water element) and set the clear intention to receive telepathically the energy gifts, initiations and activations I’ll be transmitting during the retreat workshop ‘Self-Mastery of the Human Emotions’. Blessings from the Oceans, Amara Tia Ann. “The light reflected by the moon has deep transformational effect on the human emotions and psyche. From this perspective, instead of dreading full moons as the unavoidable occasions of emotional purging and detoxification which some of you may be feeling right now, a more enlightened attitude and response would be to open your heart to welcome these monthly opportunities to uncover the hidden gifts and wisdom of your emotional and mental bodies. Eclipses are by no means coincidental or random astronomical events. Just as the human experiences are seeded, occur and assimilated through cycles of time, eclipses are sync up with your evolutionary cycles to provide further thrust and momentum to the anticipated awakening of the human race. Through your reincarnations, many of you have played the game of duality on Earth for numerous cycles to live out the illusion of the absence of light. With your freewill and focused intent, you can choose to wake up from this illusory dream of separation, lack and fear by in-gathering light to your conscious awareness. This full moon lunar eclipse can be the doorway to such an initiatory process, if you so desire. Channeled 26th July 2018, Singapore. ‘In-gathering light to your conscious awareness’ can be interpreted as building and expanding your subtle bodies to quicken the awakening of your spiritual DNA. The intended effect is for you to begin creating your physical realities consciously and effectively by engaging the awareness (awakened wisdom) of your nature as a light being. In relation to point #1, the energy transmissions for DNA Recoding and the accompanying meditations are available at previous post Be Peace and Surrender to Divine Will – 12th July 2018. Intuitively, I would interpret Thoth’s advice “however, consciously maintaining a state of peace and total surrender will enable a smoother and quicker integration” as: our body will be able to bring through the incoming ascension energies naturally without the need for an active intervention by ourselves. Nevertheless, the integration outcome will differ for individuals, depending on the extent to which we are able to think, feel, and act from a space of peace, surrender and inner knowing throughout this eclipse season.